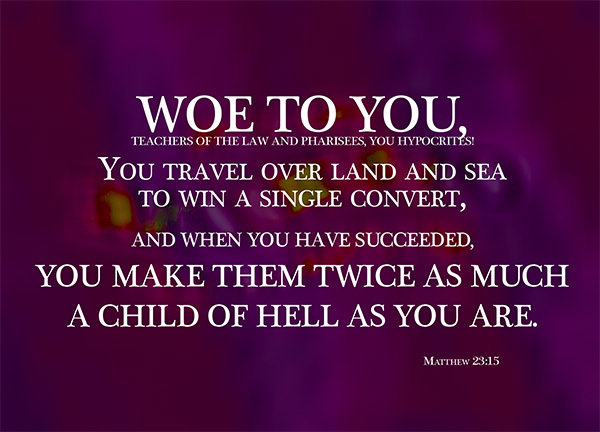 In Matthew 23 Jesus begins an analysis into the characters of the Pharisees and proceeded into his famous Seven Woes speech, berating the Pharisees for their hypocrisy. In today’s study we will focus on the second woe, and how these Pharisees failed in their mission trips and instead became a stumbling block to the faith of others. In this study we will examine the importance of our positions and how it influences others around us. Jesus did not undermine their leadership positions. In the hierarchy of the Jewish synagogues; in the context of Jewish culture and tradition; these Pharisees are leaders, and Jesus recognized it – The teachers of the law and the Pharisees sit in the Moses’ seat. So you must obey them and do everything they tell you to do [Matthew 23:12-3]. It was not their preaching but their practicing that He condemned. The law did indeed come from the Lord, and was not wrong. But their hypocritical emphasis of it was wrong. The problem was not with the information, but the way the teachers behaved. Not practising what they preach out of a real desire for God, but for a desire of being applauded and respected by others. Let us compare these Jewish teachers of the law to the Christian teachers – though at the time of Jesus’ Seven Woes speech, there was no church yet, and there were no apostles yet, and there were no Christian teachers yet, but we can see a sharp contrast between these two groups of men in position – Now in the church at Antioch there were prophets and teachers: Barnabas, Simeon called Niger, Lucius of Cyrene, Manaen (who had been brought up with Herod the tetrarch) and Saul [Acts 13:1]. These men were in distinct offices in the New Testament church. They were responsible for teaching, correcting and supporting all the Christians in that period of time. It was a position of privilege, and if they were anything like the Pharisees, they would have become rich and proud, and accepted the praise and respect of the people. They would have chased and demanded for offerings and for money from the people [1 Cor 9:12]. But no, they understood that their positions of privilege were a gift from God and meant to be used for the interest of Christ; for the interest of others, and not for their own interests [Acts 4:36-37]. They understood that they too were humans and sinners and undeserving of glory [Acts 14:15] Because they understood that, they were humble in their service. Their humility drives their obedience, integrity and hunger for The Lord. The influence of the Pharisees was great at that time. They know a lot about the law, and they are wise people, able to persuade and convince. But what did Jesus say about their converts? Because of these Pharisees, these converts will be negatively influenced. As they learn from the Pharisees and imitate them instead of Christ, they will be made into twice as much of a son of hell as these Pharisees. What strong words! Son of hell, not son of God’s kingdom! Even as they are taught about God, they will not be led into God’s kingdom but instead led away. Why? Because the only way to God is through Christ, whom the Pharisees deny – I am the way and the truth and the life. No one comes to the Father except through me [John 14:6]. Mission trips are the in thing now. Churches hold all kinds of mission trips every season, and that’s a very good thing. Spreading the gospel to the ends of the world is one of our duties as believers. But how often do we check our hearts when we go on such trips? Are we practising what we preach? Or are we forming a bad role model and bringing people into a false religion that we claim to be Christianity? Even if we do not travel over land and sea to win a single convert – let’s think about local evangelism. We may be able to bring our family and friends to God. But when we win their hearts for the Lord, are we teaching the the gospel of Christ? Or did they believe something else through the impression that your daily actions, speech and decisions give them? Have we forgotten to be humble and focus on their needs? Are we setting a bad example, that it will be better for them to not imitate us? Let us not be hypocrites. Let us not become a stumbling block to the journey of faith for others. It is one thing to harm our own faith and choose to lead an unChristlike life. But it is entirely a different thing altogether to bring others into this unChristlike life and pretend that it is okay. I don’t want this woe. Do you?